Since 1952 - 1956 Topps are a little larger than the 1957 - current cards, only 8 cards fit on a page. 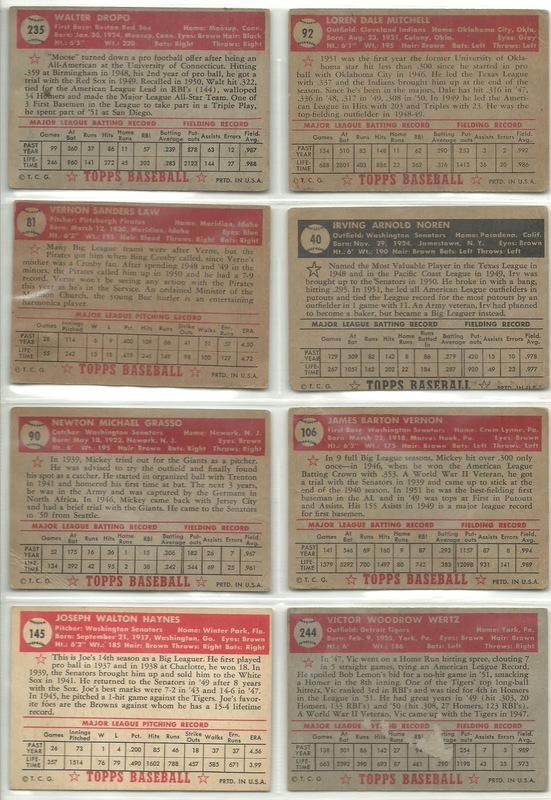 The 407 card set is considered the father of modern baseball card sets. It was issued in 6 different series (#1- #80, #81 - #250, #251 - #280, #281 - #300, #301 - #310, and #311 - #407). I didn't realize until writing this that the different series were not the same size, or even at least roughly the same size. 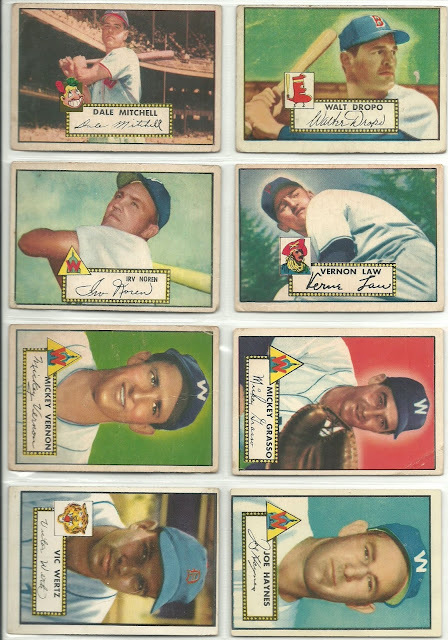 Let's take a look at the cards that I have in my 1952 page. #92 Dale Mitchell - A two time All-Star (1948 and 1952), Mitchell won the World Series with the Indians in 1948 and was the final out in Don Larsen's 1956 World Series perfect game. #235 Walt Dropo - Dropo was drafted by the BAA (Basketball Association of America) and the NFL, but chose baseball. He debuted with the Red Sox in 1950 and was an All-Star and won the Rookie of the Year award. During his rookie season he hit .322 with 34 home runs and led the American League with 144 RBI. He broke his wrist in 1951 and was never the same. #40 Irv Noren - Noren is pictured here with the Senators, but just 12 games into the 1952 season he was traded to the Yankees. It was with New York that Noren would win 3 World Series and earn an All-Star nod in 1954. #81 Vernon Law - Vern Law was selected to both All-Star games in 1960 and won the N.L. Cy Young award going 20-9 with a 3.08 ERA helping the Pittsburgh Pirates win the World Series that same year. No Mickey Mantle, but I do have two other Mickeys from the 1952 Topps set. #90 Mickey Grasso - Grasso spent parts of seven seasons fairly quiet in the big leagues, but prior to that he was a prisoner of war in World War II, losing 60 pounds while being held captives in Germany. #106 Mickey Vernon - Vernon was a 7 time All-Star and two time A.L. batting champion during his 20 year playing career (even after losing 2 full seasons to serving in the U.S. Navy during World War II) and then became the first manager of the new Washington Senators in 1961. #145 Joseph Haynes - Haynes married into the Griffiths family who owned the Washington Senators, so not only did he spend two different stints with the Senators as a player, but he stayed on as a coach after his playing career ended. #244 Vic Wertz - The four time All-Star is probably best known as the batter who hit the ball that Willie Mays made his famous over the shoulder catch during the 1954 World Series. You can see some variation in the card backs. Cards from the first series came in red and black (#40) back versions and cards in the second series were printed on both white (#145) and dark cardstock. What are your thoughts on 1952 Topps? Do you have a favorite card from this set? Congratulations on completing your page. This is definitely a cool project. I only own two cards from this set and love them both. But if I had to pick a favorite... I'd go with my Zernial. 52' is tough. I do like the variation of the red and black backs, and then also the cream and grey backs. Although just a card of each regardless of back would be a dream. I have 11 of the 407. Congrats on the complete page. Vern Law's card is one of my favorites in that set - with the trees in the background, he looks like a giant!